The Unfinished Book of Poetry 2018 is the 14th edition of this unfinished series, and once again features new poems by young writers from across the city. The 42 young writers from five schools display a wonderful standard throughout, supported by the five enthusiastic assisting writers, some of whom are now regulars in that role. Thanks and congrats to all of the young writers: as Coláiste Daibhéid faoi chúram Bernadette Nic an tSaoir i Leabharlann an Cathrach; from Terence MacSwiney Community College with Lani O’Hanlon in Hollyhill Library; from St Patrick’s College led by Paul Casey in the Frank O’Connor Library, Mayfield; from Coláiste an Spioraid Naoimh led by Liz O’Donoghue in Bishopstown Library, and; from North Presentation Secondary School with Matthew Geden in Blackpool Library. I am delighted to acknowledge the work of Maeve Dineen, Community Arts Co-ordinator, Paul Casey of Ó Bhéal, all the Libraries staff in Hollyhill, Mayfield, Bishopstown, and Blackpool, coordinated by Eibhlín and the Children & Young People’s services team at the City Library. 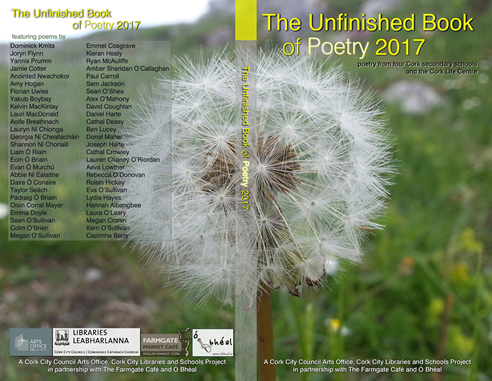 The Unfinished Book of Poetry 2017 is the 13th edition of this annual anthology, a series which has become a collector’s item over the years. 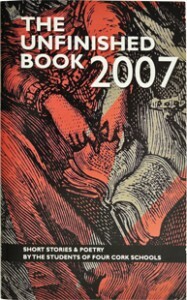 The poems range widely both in subject and form. What is perhaps most striking is the sheer intensity and abundance of creativity, often with remarkable maturity and courage being displayed, by what are, one has to remember, still young writers. This year 52 young writers are involved, from four Cork city schools as well as, for the first time, the wonderful Cork Life Centre. 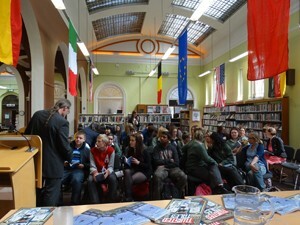 and at Tory Top library, Presentation Secondary School by Paul Casey. It is my great pleasure to once again thank Maeve Dineen, Community Arts Co-ordinator at Cork City Council Arts Office, and all the Cork Libraries staff at Blackpool, Bishopstown, Douglas, and Tory Top Libraries, all coordinated by the Children & Young People’s team at the City Library, Grand Parade. A special thanks also to our partners The Farmgate Café and Ó Bhéal. on Wednesday 20th April, 2016 at 12pm. Cork Central Library, Grand Parade. 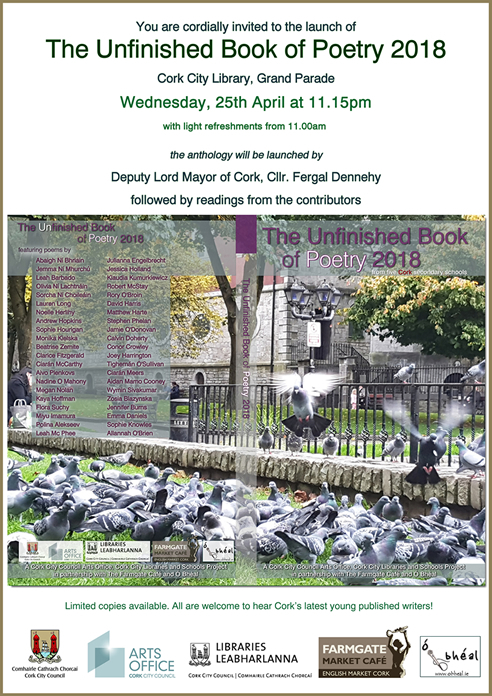 2016 welcomes the 12th (centenary) edition of the Unfinished Book of Poetry, featuring verse written by students from five Cork secondary schools. 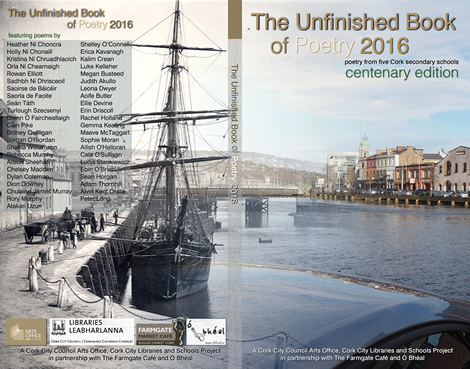 Ó Bhéal has curated the Unfinished Book since its 9th edition in 2013. 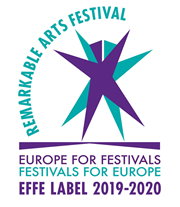 Since 2005, this now vital and vibrantly successful youth arts initiative has been funded and driven by the Cork City Council Arts Office and Cork City Libraries. In 2016, The Farmgate Café became an official sponsor, allowing the project to return to working with five schools instead of four. Aside from the prolific crafting of fresh uninhibited writing to the polishing of a poem through attending an extended series of workshops with contemporary poets, the students also gain insights into the broader spectrum of what is possible in poetry and within themselves, often breaking down the invisible barriers encountered when writing. The project is also focussed on enabling young people to find their voice through their creative writing and to read their work aloud, whenever possible. 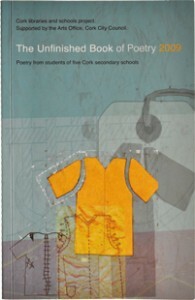 This year’s Unfinished Book celebrates the artful words of forty-four students from five Cork City Schools. The assisting poets and schools are Leanne O’Sullivan working with Mayfield Community School, Bernadette McIntyre at Coláiste Daibhéad, John W Sexton at Christ the King Girls’ Secondary School, Eileen Sheehan at Terence MacSwiney Community College and Matthew Sweeney working with Coláiste Chríost Rí. The respective libraries were Mayfield Library, Cork City Central Library, Douglas Library, Hollyhill Library and Tory Top Library. 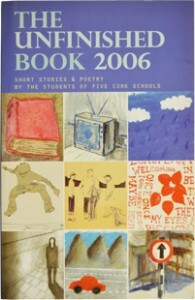 During Cork 2005, the European Capital of Culture year, library staff conceived the idea to produce a book of writing by young people that would continue on beyond that year’s celebrations. The project became ‘The Unfinished Book’ and involves each year co-ordinating a series of nine creative writing workshops, for each of four/five schools (usually at transition year level). The workshops are held in city libraries local to each school, facilitated by professional writers and poets based in and around Cork. 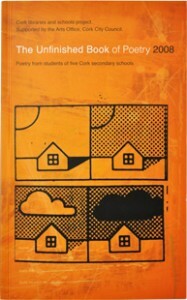 The students’ work is then collected by Ó Bhéal, edited and published in this volume, then launched by the Lord Mayor on Teen Day during the World Book Festival. The workshops have also fostered creative, personal and educational development, while supporting participants in gaining new insights into the art of poetry writing and its potentials – at this vital stage of learning. The resulting works are often outstanding, even breathtaking, year after year. The students see their works published in professional print and also have the opportunity to read their contributions at the launch, which many or most do. This year the participating poets and schools were, I Leabharlann na Linne Duibhe, d’oibrigh Simon Ó Faoláin le daltaí as Gaelcholáiste Mhuire, Sarah Hayden with students from Ashton School in the City Library, Gabriel Fitzmaurice and young students from Bishopstown Community School, and Alannah Hopkin’s group from Presentation Girls Secondary met in the Tory Top Library. After our tenth birthday last year, we are now into the second decade of the Unfinished Book series. Who would have imagined that a project which has its genesis in Cork’s year as European Capital of Culture would take on a life of its own. 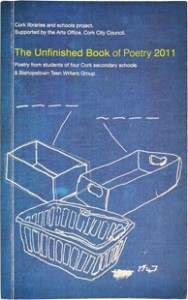 Since 2005 nearly two dozen writers have provided workshops for Transition Year students from almost forty Cork schools, in a project which has seen over 400 young writers find their way into print. This year, nine workshops were held in each of four Cork City libraries over the course of four months, by some of the finest of Cork and Munster’s established writers. I Leabharlann na Linne Duibhe, d’oibrigh Simon Ó Faoláin le daltaí as Gaelcholáiste Mhuire. Sarah Hayden held her workshops with students from Ashton School in the City Library while Gabriel Fitzmaurice worked with the young students from Bishopstown Community School and Alannah Hopkin’s group from Presentation Girls Secondary met in the Tory Top Library. Paul Casey from Ó Bhéal was once again editor and overall curator. 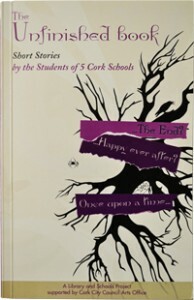 It is a continuing pleasure for us in Cork City Libraries to be involved, to host the workshops, to witness these young writers flourish at this crucial stage of their imaginative development, and to share in the fostering and success of the project with the Community Arts section of the City Council Arts Office, and with Ó Bhéal. 2016 will see the return of a fifth school participating in the Unfinished Book, thanks to Kay Harte and additional sponsorship from the Farmgate. Thanks once again to Maeve Dineen, Community Arts Co-ordinator and Acting Arts Officer, our partner for the 11th time, to all the Libraries staff in Blackpool, Tory Top, Bishopstown and to the Children & Young People’s services at the City Library, to the professional writers, and most of all to each of this year’s talented participants. This year the participating poets and schools were, Ian Wild with St.Vincent’s Secondary, Tina Pisco working with Douglas Community School, James Cummins at St Patrick’s College, and Doireann Ní Ghríofa with Coláiste Daibhéad. This year the participating poets and schools were Afric McGlinchey in Presentation Girls’ School, Matthew Geden working with Bishopstown Community School and Kathy D’Arcy at Deerpark CBS. This year the participating poets and schools were Coláiste an Spioraid Naoimh, Bishopstown and poet John W Sexton, St. Patricks College and poet Eileen Sheehan, Colaiste Daibheid and poet Gabriel Fitzmaurice, the North Monastery Secondary School and poets Liz O’Donoghue and Gerry Murphy and Christ King Girls Secondary School and poet Leanne O’Sullivan. 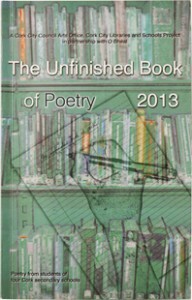 Please view the Unfinished Book of Poetry 2012 here. This year the participating poets and schools were Eileen Sheehan, Leanne O’Sullivan, Gabriel Fitzmaurice, Liz O’Donoghue, and John W Sexton. 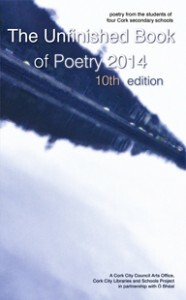 This year the participating poets and schools were Adam Wyeth, John W Sexton, Billy Ramsell and Eileen Sheehan. This year the participating poets and schools were John W Sexton, Billy Ramsell, Eileen Sheehan, Leanne O’Sullivan and Gerry Murphy. 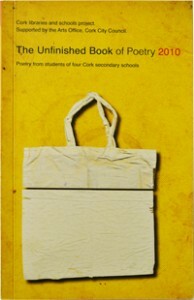 This year the participating poets and schools were Gerry Murphy, Adam Wyeth, John W Sexton, Billy Ramsell and Ian Wild. 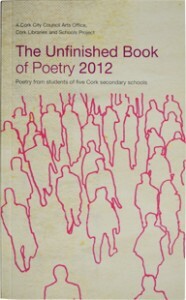 This year the participating poets and schools were Kevin Doyle, Alannah Hopkins, Vincent McDonnell, and Gerry Murphy. 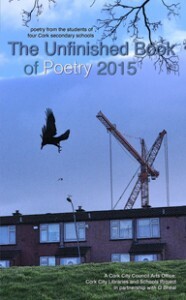 This year the participating poets and schools were Kevin Doyle, Martin Kelleher, Vincent McDonnell, and Gerry Murphy. This year the participating poets and schools were Bernadette Leach, Kevin Doyle, Ian Wild, Alannah Hopkins, and Martin Kelleher.